Lewes-based Cape Water Tours and Taxi takes people to the Delaware Bay to learn about the creatures that live there. Captain Steve and tour guide Kathleen reach into the bucket to pull out some creatures. Tourists visiting the Chesapeake Bay region have plenty of options: boating, fishing, dining and more. But one particular type of tourism that has grown over the last five years gets those visitors thinking about the natural environment around them: Ecotourism. Delaware Public Media's Katie Peikes reports on ecotourism for Chesapeake: A Journalism Collaborative. Imagine you’re at the beach in Rehoboth, laying on a towel under the sun. Then, you take a walk on the boardwalk filled with lively music and you spend a few bucks on local saltwater taffy: That's tourism. Now, close your eyes and imagine you’re on a boat with about 20 other people, cruising the Delaware Bay in mid-July to learn about the creatures that live there: That's ecotourism. Kathleen LaForce is a tour guide with Cape Water Tours and Taxi. "We really want people to appreciate the environment that might be right in front of them," LaForce said. She drops a net into the Delaware Bay to scoop up creatures from the water. "This net is going to unfold like an ice cream cone," LaForce said. The crew tows the net in the water for about five minutes. Then, they pull it back in to the tune of "The Net Hauling Song" by The Dubliners. "We got some good stuff!" LaForce said. LaForce then tells the tourists about each of the creatures she’s caught. She picks up a female blue crab. "So if you see here, this brown mass right there, those are just the remnants of her eggs. Those sponges they have that we're talking about — the millions of eggs — are like thick. They're really big and they're hard to miss," she said. 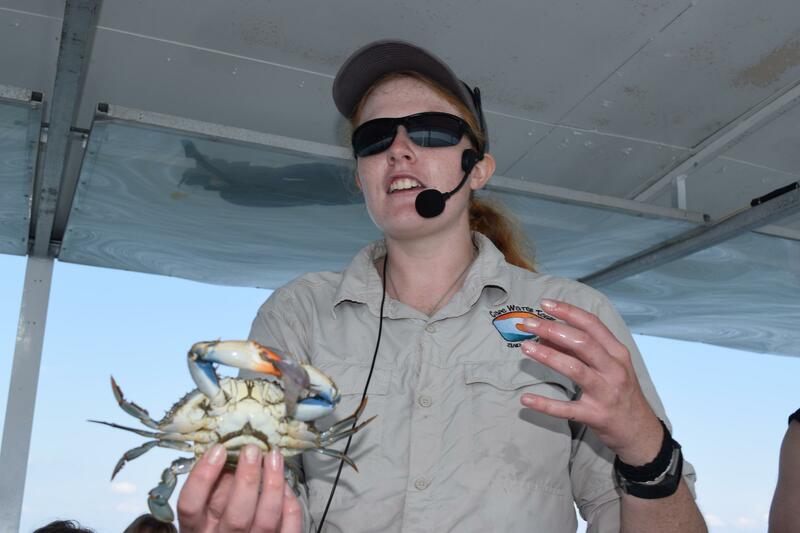 Kathleen LaForce shows tourists on the Cape Water Tours and Taxi a female blue crab. Learning about these creatures left Exton, Pennsylvania residents Nancy and Morris Shelton in awe. The Sheltons were vacationing in Delaware for a few days in July. "While we've gone fishing and crabbing and all those types of things on our own, we learn a little bit more about the creatures themselves and get some perspective from that standpoint," Morris Shelton said. "You don't ever want to stop learning," Nancy Shelton said. Cape Water Tours and Taxi owner David Green said his business has grown quickly since he launched it in 2012. They started with weekend trips to Dewey Beach on a 26-passenger boat. Now, they have two vessels and offer 12 different tours. "We live in such an electronic and virtual world that people forget there's incredible animals and wildlife that are right here in our backyard," Green said. Other than the anecdotal information about his business' growth over the last five years, there isn't much data on ecotourism’s economic impact. In 2010, the Maryland Office of Tourism and Maryland State Parks did a parks’ survey. It didn’t address ecotourism specifically, but Connie Spindler, a spokeswoman for the tourism office, says with 49 percent of overnight visitors coming from out of state, she sees potential. "There's plenty of room for growth, to be honest, and this is a way to get people, get visitors out to areas that they might not know about or might not have thought about visiting," Spindler said. Others in the region see that same potential. On the Virginia Oyster Trail, you can learn about shellfish and how they clean the bay, while also getting a taste of local oysters. Now in its second year, the oyster trail explains where local oysters come from. said Sherri Smith, the executive director of the Artisans Center of Virginia, the group that runs the trail. "It's actually putting a focus, a lens on our watermen communities, all around the coastal region, some of them very small, some of them very dependent on that watermen culture," Smith said. And whether you’re slurping a local oyster or sitting on a boat learning about what lives in the bay, Smith says ecotourism educates while it entertains. "When you go on a tour and they're pulling species out and putting them on the boat, you're looking at a lot of symbiotic relationships in the biodiversity sense of what is under the water. When you can recognize that there's also a critter there that you can see on a restaurant menu, it puts things into perspective about the relationships that we have with our environment," Smith said. It redefines how visitors discover the Chesapeake Bay region. Dolphins in Chesapeake Bay: Unusual, or no big deal? Earlier this summer, we started hearing reports of dolphins in Chesapeake Bay. Some thought it was unusual; others said it was no big deal. So Joel McCord went searching for them for Chesapeake: A Journalism Collaborative. In 2009, President Obama signed an executive order recognizing the Chesapeake Bay as a national treasure. That began a federal-state partnership to restore and protect it, including a plan to revive the wild oyster population through sanctuaries on restored reefs in Maryland and Virginia. But President Trump's proposed budget eliminates funding for that plan, further complicating an already complicated effort to restore the reefs gutted by a century of overfishing, disease and pollution. Pamela D'Angelo reports for Chesapeake: A Journalism Collaborative. Contributor Pamela D'Angelo reports on impact President Trump's budget cuts could have on Chesapeake Bay oyster restoration.